Got Baby? 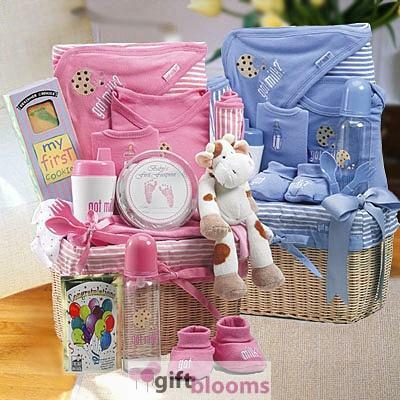 Welcome the new bundle of joy with wonderful gifts in a coordinated fabric lined basket. Includes matching one-piece body suit, booties, receiving blanket, bib, burp cloth, washcloth, bottle, sippy cup, fork and spoon . . . all with the "Got Milk?®" theme. Large size also includes baby's first footprint kit, a cuddly plush cow, and congratulations coffee and cookies for the new parents.